OMAHA — March 7, 2016 — Audiences are accustomed to seeing Erin Alarcón dancing iconic roles such as Odile in Swan Lake, the title role in Giselle, and Sugar Plum Fairy in The Nutcracker. 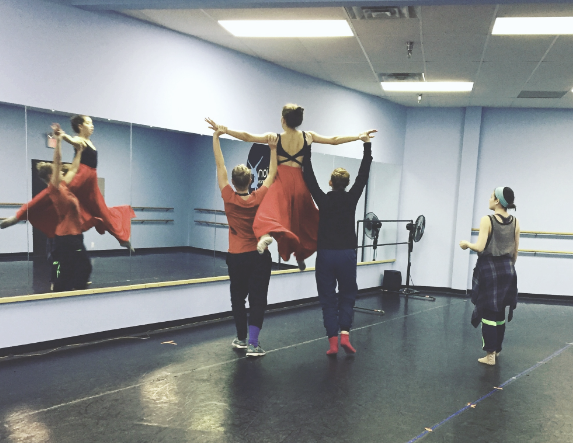 This spring, Erin takes on another of her favorite roles: choreographer. Erin’s movingly personal new work, One in Three, is featured in American Midwest Ballet’s Momentum: Go West! April 1 and 3. We spoke with Erin about her work, her process and her inspiration when choreographing for the company. Tell us about your new piece. One in Three is a contemporary work for twelve women that explores the idea of the female warrior. I have been fortunate in my life to be surrounded by many strong women and I wanted take a moment to celebrate them. On stage you will see me play with the idea that as dancers, we can be both delicate and graceful as well as strong and powerful. What does the title One in Three mean? One in three women will experience a physical or sexual assault. This is a statistic that hits home for me as some women in my life have gone through this. I have heard and observed how often times these women are made to feel shame or as if they are the ones to blame. We must stop tearing down these survivors and start seeing them as people; as our mothers, daughters, sisters, best friends, and coworkers — because they are. One in three; let us rise above this statistic together. When casting this piece, what qualities were you looking for? I knew I wanted a large cast of all women -sorry boys! It was fun figuring out how I wanted to utilize each of the dancers. Every one of them has something special about their dancing. For example, Katherine Eppink has some of the most spectacular allegro work and Chloé Watson plays really well with texture in her movement. I wanted to hone in on their strengths and highlight them for the audience. What was the biggest challenge and the biggest joy for you in creating this dance? The greatest challenge in creating this piece also turned out to be the greatest joy. I had twelve incredibly talented professional dancers to work with so there was no limit to what I could give them. Having no restrictions meant having the entire dance “dictionary” to choose from. What do you hope One in Three will convey to your audience? Recently I feel as if there has been a lot of attention on what it means to be a woman. If you look, you can find media coverage telling you “this is how you can be a great wife, mother, daughter, sister, best friend etc.” While I think those relationships are important, I also think it is important to allow women to define themselves as individuals with their own ideas and stories to share. What do you consider when you begin to choreograph a new work? For me, it’s all about the music. I am constantly listening to music but I know instantly when I need to choreograph to a piece. Do you feel there is one quality that remains constant throughout the works you create? Patterns. I love looking at how dancers transition from one formation to another. For that reason, my favorite place to watch dance has always been the balcony. Swan Lake Act 2 from the balcony is magic. When did you first start choreographing? I can’t remember a time I haven’t choreographed! My dad shared his love of music with me from a very young age. He always had something playing in the house or in his car. Every time I would listen, I’d always create “music videos” in my head and eventually they transformed into dances. Who are some of your biggest inspirations as a choreographer? That’s tough. Of course there are the big names like William Forsythe and Jiří Kylián but I think it’s important to be inspired by the people around you. A good choreographer, like a good dancer, is always looking to learn and expand one’s movement vocabulary. How does performing a work compare to creating it? Contrary to what one might think, in performing I feel as if I have more control over the outcome of the performance. I’m the one guiding the audience through the movement and taking them on a journey with me. As a choreographer, you have to allow your dancers that freedom, which is always exciting to watch. Do you enjoy dancing in your own works? I usually like wearing one hat at a time. That being said, I do enjoy performing in collaborative choreography say in a pas de deux or trio. What are some things you still aspire to do in dance? I would love to tackle the daunting and exciting task of choreographing a full length ballet. On my list are Anastasia and The Crucible. Erin Alarcón’s One in Three is among the featured works in Momentum: Go West!